Semtech Corporation (Nasdaq:SMTC), a leading supplier of analog and mixed-signal semiconductors, will present a paper focusing on serial digital interface (SDI), a versatile and cost-effective solution for transporting all streamed media, from standard definition (SD) to ultra-high definition (UHD), high dynamic range (HDR) and high frame rate (HFR) services. 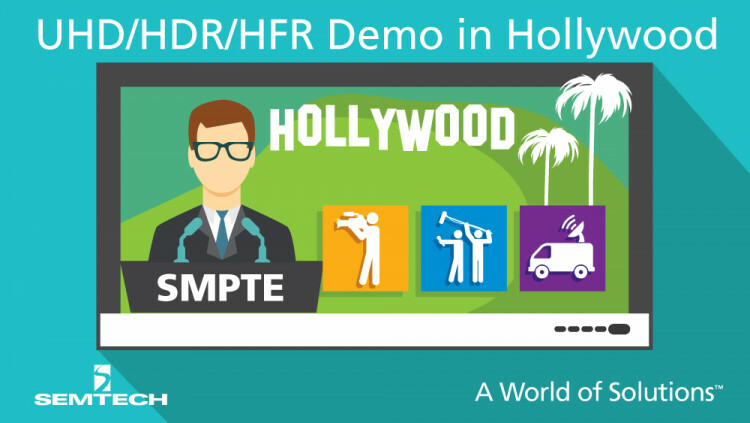 The paper will be presented by SDI expert, Nigel Seth-Smith, Manager of Strategic Technology for Semtech’s Signal Integrity Product Group, at the 2016 Society of Motion Picture and Television Engineers® (SMPTE®) Annual Technical Conference at the Loews Hotel in Hollywood on Oct. 26 at 10:30 a.m. local time. SDI is the standard broadcast interface used today and has evolved into the ideal interface for next-generation media streaming as the broadcast industry continues to adopt new streaming services, including UHD, HDR and HFR. Seth-Smith will discuss the flexibility of SDI to universally transport media from SD to UHD without overhauling existing infrastructure, and how it is a cost-effective and reliable solution for continuously evolving data rates and formats. The presentation will also cover the importance of Gearbox Technology for seamless, single-chip rate conversion between different SDI interface profiles, enabling broadcast equipment manufacturers to produce standards-compliant media streaming solutions that support both existing and future UHD/HDR/HFR infrastructures. Semtech is an industry leader in high-speed signal integrity solutions for the broadcast (UHD-SDI) and datacom (10GbE, 40GbE and 100GbE) markets. Seth-Smith has nearly 40 years of experience with broadcast engineering, and he is actively involved in the standardization of next-generation interface technologies with SMPTE, the International Telecommunications Union Radiocommunication Sector (ITU-R) and the Institute of Electrical and Electronics Engineers (IEEE). Semtech will showcase four products from its 12G UHD-SDI product portfolio at the SMPTE Annual Conference Exhibition in booth 411: the GS12070 Gearbox, the GS12090 configurable retiming cable equalizer and cable driver, the GS12141 retiming adaptive cable equalizer and GS12181 retiming cable driver. In addition, the GN1090/GN1190 four-channel array receiver and VCSEL array driver, from Semtech’s optical product group, will be featured in a demonstration to show their effective use in UHD, HDR and HFR applications. Semtech’s UHD-SDI products feature ultra-low power consumption and provide industry-leading performance at up to 12Gbps rates. UHD-SDI is ideal for UHDTV infrastructures that include routers, cameras, monitors, switchers and more. It offers pristine image quality, is backwards-compatible with existing SDI systems and is standardized by both SMPTE and the International Telecommunication Union (ITU), simplifying UHDTV infrastructure upgrades and reducing risk for broadcasters. Winner of an Oscar® and multiple Emmy® Awards, the Society of Motion Picture and Television Engineers® (SMPTE®) is a global leader in the advancement of the art, science, and craft of the image, sound, and metadata ecosystem. A professional membership association that is internationally recognized and accredited, SMPTE advances moving-imagery education and engineering across the communications, technology, media, and entertainment industries. For a century, SMPTE has published the SMPTE Motion Imaging Journal and developed more than 800 standards, recommended practices, and engineering guidelines. More than 6,000 members — motion-imaging executives, engineers, creative and technology professionals, researchers, scientists, educators, and students — who meet in Sections worldwide, sustain the Society. Through the Society's partnership with HPA®, this membership is complemented by the professional community of businesses and individuals who provide the expertise, support, tools, and infrastructure for the creation and finishing of motion pictures, television programs, commercials, digital media, and other dynamic media content. Information on joining SMPTE is available at www.smpte.org/join. Semtech Corporation is a leading supplier of analog and mixed-signal semiconductors for high-end consumer, computing, communications and industrial equipment. Products are designed to benefit the engineering community as well as the global community. The company is dedicated to reducing the impact it, and its products, have on the environment. Internal green programs seek to reduce waste through material and manufacturing control, use of green technology and designing for resource reduction. Publicly traded since 1967, Semtech is listed on the NASDAQ Global Select Market under the symbol SMTC. For more information, visit www.semtech.com. All statements contained herein that are not statements of historical fact, including statements that use the words “will” or other similar words or expressions, that describe Semtech Corporation’s or its management’s future plans, objectives or goals are “forward-looking statements” and are made pursuant to the Safe-Harbor provisions of the Private Securities Litigation Reform Act of 1995, as amended. Such forward-looking statements involve known and unknown risks, uncertainties and other factors that could cause the actual results of Semtech Corporation to be materially different from the historical results and/or from any future results or outcomes expressed or implied by such forward-looking statements. Such factors are further addressed in Semtech Corporation’s annual and quarterly reports, and in other documents or reports, filed with the Securities and Exchange Commission (www.sec.gov) including, without limitation, information under the captions “Management's Discussion and Analysis of Financial Condition and Results of Operations” and “Risk Factors.” Semtech Corporation assumes no obligation to update any forward-looking statements in order to reflect events or circumstances that may arise after the date of this release, except as required by law. Semtech and the Semtech logo are registered trademarks or service marks, or trademarks or service marks, of Semtech Corporation or its affiliates. Third-party trademarks or service marks mentioned herein are the property of their respective owners.